The performance of this phone is decent, and the UI is packed with features. The battery life and low-light camera performance are sub-par. The Vivo V9 looks extremely classy. I like the notch display and color output. The Gesture options are in abundance and really useful. Overall, a decent mid ranger phone with iPhone like looks. Performance could have been better as the processor is not that great. Can recommend this phone if u want to buy a phone in 20k. Overall the Vivo V9 is a good phone in this price range. Camera is not an exception. It is just ok. Build quality is good with all bells and whistles. Can go for this phone but camera is a let down. Vivo V9 is the first smartphone by the brand to feature a notch design. if you&apos;re into notch design for some reason, then this device might work out for you well. Vivo V9 is specially designed for those who want camera performance. Looking at the other specs, the device seems quite overpriced. Apart from the cameras, I don&apos;t think anything in the device is worth that much of your money. The build quality attracts tons of fingerprint and the battery life is not that great at all. I found this smartphone quite overpriced. The only thing this device is able to do perfectly is the camera performance and the rest of the other aspects are just fine. Battery life is shorter as compared to other smartphones in this price range. In terms of performance, it is powered with a fine processor which can do all of your tasks easily but still for the price, the device doesn&apos;t offer much. If only the thing which matters to you is the cameras, then only get this device. With this device, Vivo shows only thing which matters is the cameras, not the other specs. The overpriced price tag on this smartphone is not justifiable at all. Vivo did include a great camera in this device but what about battery life, performance and other various aspects. The brand completely neglected it. I would recommend you to go with some other brand or some other model instead of getting this expensive crap. 71 Pricebaba users have written their experience with Vivo V9. If you own Vivo V9, please do leave your feedback too. 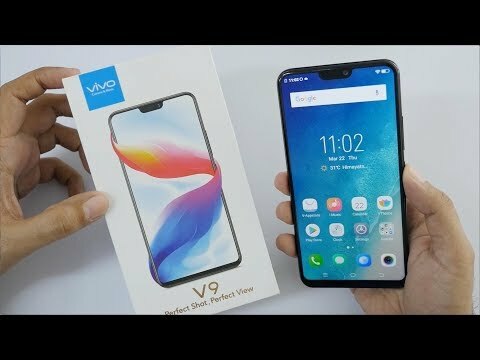 Lowest price of Vivo V9 price in India starts at Rs. 15,999 Vivo V9 is available on Flipkart at Rs. 15,999. Prices updated on 22nd April 2019. Vivo entered the notch trend with the Vivo V9 that launched in March 2018. Just like most of its smartphones, this one comes with a stunning selfie camera and a bunch of other good features. Let's see more about it in detail. The Vivo V9 has a notch on top of its screen, which gives it a look similar to the iPhone X. On the rear, it gets a fingerprint scanner and the dual cameras are vertically aligned. However, one of the major disappointments is that the V9 has a plastic body instead of a metal build. The phone is available in two different colours: Gold and Pearl Black. As mentioned earlier, the display has a notch and there are minimum bezels on all sides. The screen spans 6.3-inches and produces a resolution of 2280 x 1080 pixels, which makes it a FullHD+ display. Cameras in the Vivo V9 are quite impressive. The phone has got a superb 24-megapixel camera on the front for clicking selfies. It is further enhanced via software features that the brand offers inside its camera app. On the back, there is a dual-camera setup bearing a 16-megapixel sensor and another 5-megapixel sensor. This setup will allow you to click portrait mode pictures and much more. The Vivo V9 runs on Qualcomm Snapdragon 626 which is decently powerful when combined with 4GB of RAM. You can't expect a blazing fast performance though but everyday usage shall be pretty fine. It runs on the latest Android 8.1 Oreo out of the box but is skinned with Vivo's own Funtouch OS which might not please everyone. On the storage front, the phone gets 64GB of internal storage but it is expandable via a microSD card. Since there is a dedicated microSD card slot, you won't have to compromise on the second SIM. The Vivo V9 rocks a 3260mAh battery unit that is averagely sized and will get you a day at most with full charge. The brand has decided to opt for a Micro USB port instead of a USB Type-C. It gets a 3.5mm audio jack and all the other connectivity options like Bluetooth, Wi-Fi, 4G VoLTE are offered as well. 1. Is the Vivo V9 good for selfies? A.Yes, it has an impressive 24-megapixel camera on the front that is great for selfies. 2. Which charging connector do I need for the phone? A.The Vivo V9 needs a Micro USB charging connector. 3. How is the battery life of this phone? A. It has a 3260mAh battery unit which isn't as powerful as some of the competing phones. 4. Does it run stock Android? A. No, although it has the latest Android 8.1 Oreo, Vivo customizes the OS with its own Funtouch OS.